ITmark Seminar: it is a half day seminar to create awareness and explain the process requisites for an ITmark certification. ITmark Appraisal:consists in a series of interviews and document revision activities to perform the appraisal and concludes with the presentation of results and improvement actions. The appraisal should take place not later than 6 months from the execution of the seminar. ITmark Re-appraisal: it is only required if the appraisal result was not fully compliant and consists in checking the achievement of corrective actions. Re-appraisal should take place not later than 6 months from the end of the appraisal. 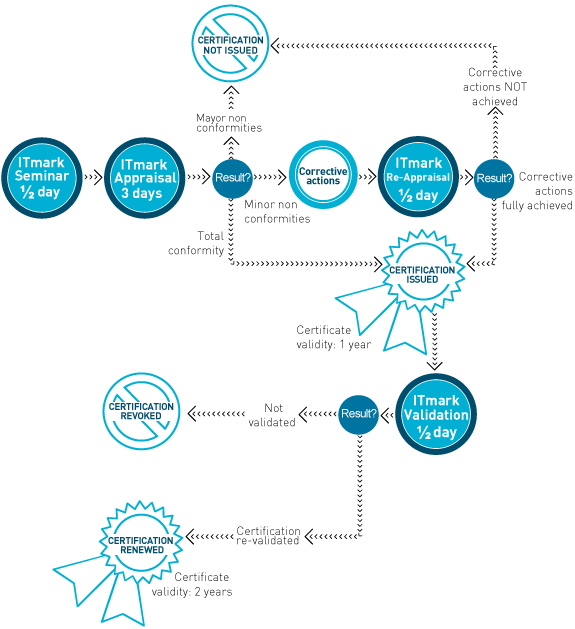 ITmark Validation: it consists of a brief appraisal to ensure that the improvement initiative is sustained. It should take place not later than one year from the end of the appraisal or re-appraisal.